Nicolai Canetti designed the Original Magnet Frame ® over 30 years ago. This iconic ‘frameless frame’ is now available in a wide variety of sizes and styles from Canetti. 50% off sale on selected items. Free Shipping (Ground within 48 lower United States) - minimum order of $300. The Original Magnet Frame ® was designed by Nicolai Canetti over 25 years ago. 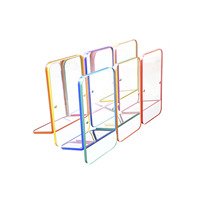 Two thick panels of crystal clear, solid acrylic held together by tiny magnet points, it is the ultimate frameless frame! The Colorful Magnet Frame is composed of two thin crystal clear acrylic panels, each one edged in a different bright color. The front panel is straight while the back panel has a bend, allowing it to stand on its own. Can be used in the vertical or horizontal position. 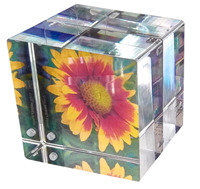 The Cube Magnet Frame is back by popular demand! 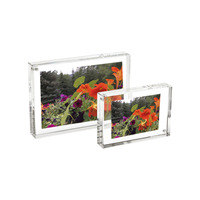 Stunning object for the home or office, this Cube is made of two thick panels of crystal clear, solid acrylic held together by tiny magnet points, with two picturew easily placed between the two panels and held securely without any hardware. The Sphere Magnet Frame is the partner of the Cube Magnet Frame. 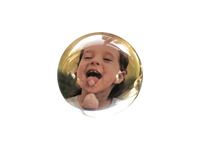 Stunning object for the home or office, the Sphere is made of two thick panels of crystal clear, solid acrylic held together by tiny magnet points to create the shape of a sphere. The picture is easily placed between the two panels and held securely without any hardware. The Wall Magnet Frame is made of two panels of solid acrylic that are held together by tiny magnet points. The panels are thinner than those in the Original Magnet Frame ® in order for it to hang securely on the wall. 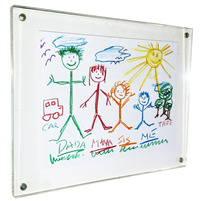 The frame has a keyhole on the back and can hang on the wall either horizontally or vertically on a nail or screw. Once mounted, you only have to remove the front panel to replace your photo. Display your most important moments or memorabilia.